I woke up before the sun rose. Not on purpose mind you, but I just couldn’t fall back asleep. So I made a cup of coffee and went out to the patio to watch the sunrise over the lake. As the sun was coming up I could hear a lot of warbler noise but I couldn’t see anything but ducks on the water. I could hear the mockingbird starting to sing, ever so gently. The blue jays began their squawking. I went out to snap a pic of the sun rising when something caught my eye in the palm tree. 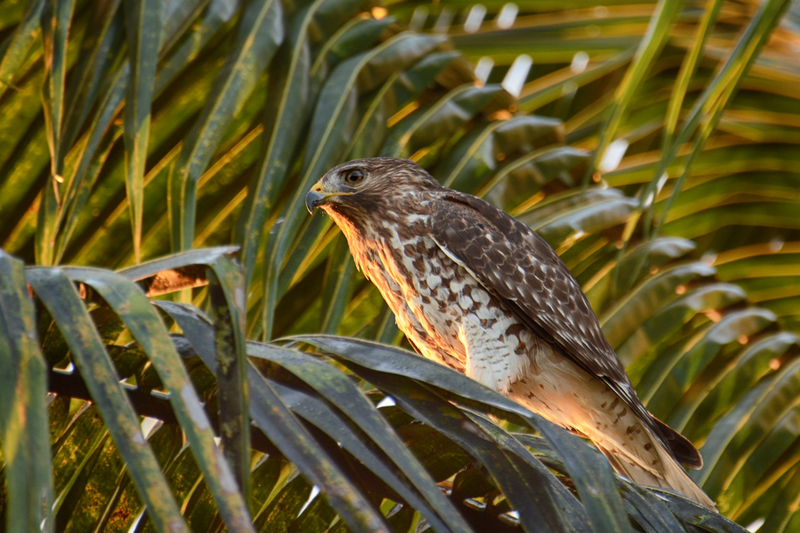 It was a juvenile red-shouldered hawk having a sunrise breakfast right there in the palm.